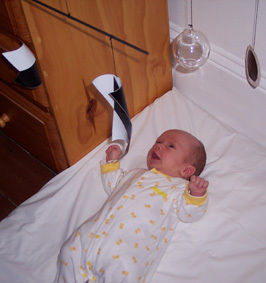 Hang mobiles slightly out of reach of your baby to allow him to practise focusing and following objects with his eyes. 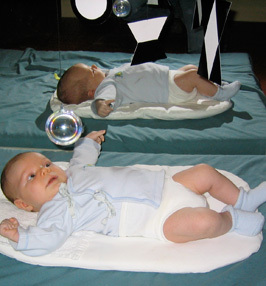 At first these mobiles should be black and white because your baby can only see contrasts to start with but once he starts to lose interest in black and white mobiles you can offer something with pastel colours. Choose mobiles that naturally float on air currents like dragonflies, hot air balloons and hummingbirds, not earthbound creatures like cats, dogs, or farm animals. As your baby grows encourage your baby to reach and grasp by using elastic to hang a rattle, a bell or baby toy within his reach. He will be thrilled when he manages to move it and it makes a noise. Make sure you place you baby underneath the mobile where he can see it and he has a chance of reaching it if he really tries hard. Observe to check that he is able to focus on it. In the early weeks he cannot focus on things that are too far away. Make sure that there is some time everyday when your child can gaze at the mobile and after a while he will start to make an effort to reach it.